Ladder and Safety Cage | Honeyville Metal, Inc.
At Honeyville we manufacture our own ladder and safety cage. 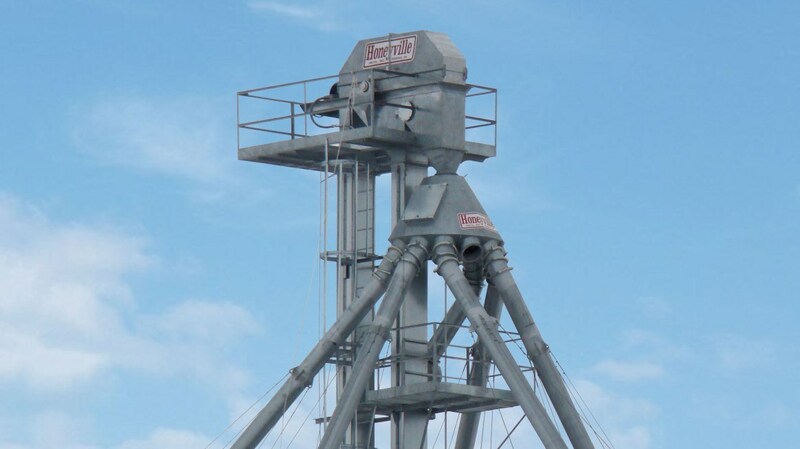 The ladder and safety cage come in 5' and 10' lengths with bolt together construction to accommodate bucket elevators of all heights. The ladder is manufactured with 7/8" HR solid rod for the rungs and 1/4" x 1-1/2" HR side strapping. 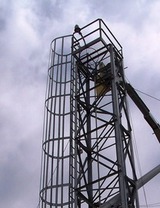 After it is welded, the ladder is is hot dip galvanized for years of durability. The safety cage is made with G90 galvanized steel. Offset Transfer Platforms and Ladder Rest Platforms are two options that we offer with our ladder and saftey cage.